Betwixt Birmingham and Stratford-upon-Avon lies the sleepy town of Henley-in-Arden. 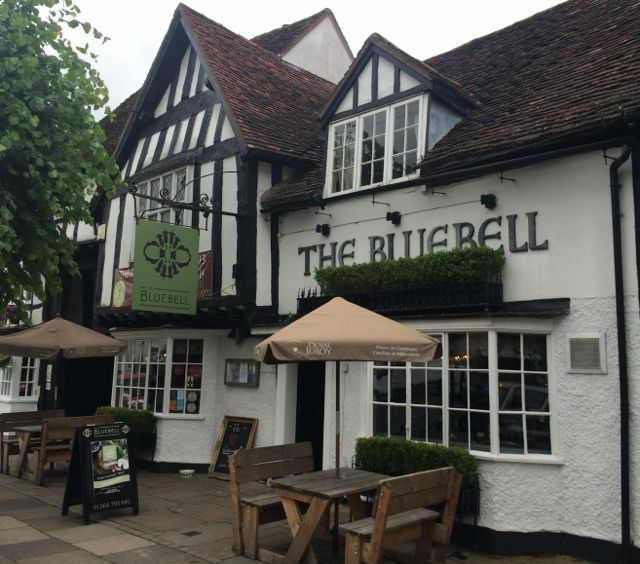 It’s 30 minutes by train from the city centre through glorious postcard perfect English countryside, and on a summery Saturday we headed there to try out a Michelin recommended pub – The Bluebell. They’ve been around a while, in fact the Tudor hostelry has been feeding and watering the public for half a millennium, so they’ve had plenty of practise. 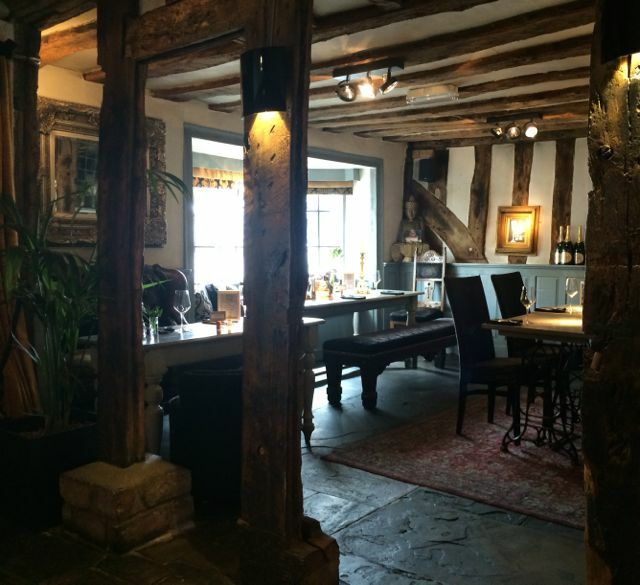 For the last decade owners Leigh and Duncan Taylor, and their head chef James Devonshire, have been offering food that has won plaudits including two AA rosettes, and the Good Food Guide Midlands Restaurant of the Year 2013. They offer coffee and cake from 10am, lunch from noon, and dinner from 6pm. Obviously there’s an à la carte menu and they’ve also just launched a two course for £10 lunch club, available Tuesday to Saturday, noon till 2.30, and that’s what we went to sample. The restaurant and bar are intimate spaces with low Tudor beamed ceilings, flagstone and wooden floors, and heavy velvet drapes. The furnishings are eclectic and owner Leigh’s eye for design is obvious with shabby chic furniture, artistic lighting, and quality stemware adding to the overall feeling of lusciousness. The private dining room looked particularly inviting. you get what you’re given i.e. there are no options. If however you don’t like that day’s offering (I think that’s unlikely) you can of course eat from the normal menu. On the day we went, the lunch club menu comprised Sweet Corn and Basil Velouté followed by Cottage Pie with pickled red cabbage, and dessert of Pavlova with English Strawberries and Chantilly Cream. 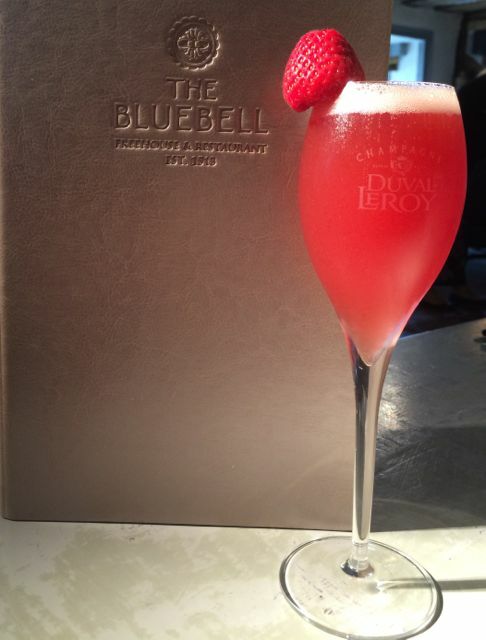 We started our lunch with a “Bluebell-ini” (£7) that’s Prosecco and strawberry juice, with a ripe strawberry on the rim. Our first course was the Velouté of Sweet Corn and Basil. Served in a vintage tea cup and saucer the smooth and creamy velouté was well seasoned, piping hot, with light sweet corn and basil flavours. It was served with sourdough bread made onsite from a “mother” dough that Chef James has lovingly nurtured for three years. The sourness of the bread worked well with the sweetness of the corn. As you’d expect The Bluebell are big on using the best suppliers, and the quality of produce shone through, worthy of mention was the creamy butter from Netherend farm, and that they use Aubrey Allen butchers for their meats. 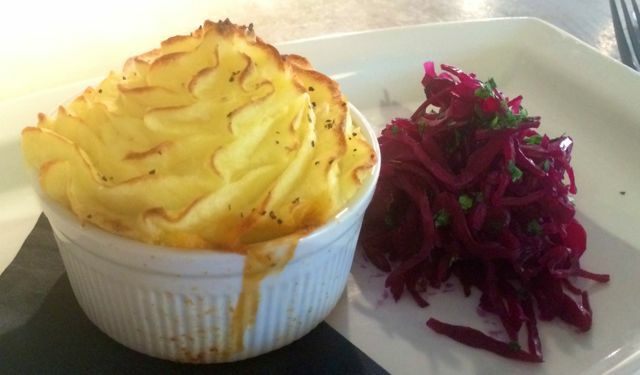 The main was a Cottage Pie, which initially I thought might not be summery enough, but the side of pickled cabbage with star anise lifted it so that it was not at all heavy. The pie itself had great beefy flavours with a good texture, and the mash was fluffy and buttery and attractively piped with crispy grilled edges. The wine list is impressive and there are 15 by the glass. I went for the delightful Veramonte Chardonnay (£6.25 a glass, or £25 for the bottle). We also had a glass of the Luigi Bosca La Linda Malbec (£7.15 a glass, or £28 for the bottle). Those wine lovers amongst you will know from just those two name-drops that there are plenty of good wines to choose. Not a wine drinker? Worry not, there’s a good selection of other drinks including Purity ales (a local independent brewery). In the interests of fully reviewing it, obviously we had to have desert. 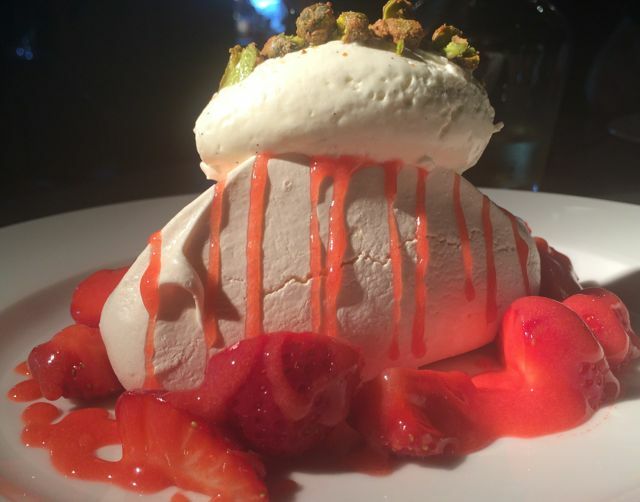 A large pink quenelle of crispy sweet meringue was topped with Chantilly cream, roasted pistachios, and English strawberries. A super finale to a summer luncheon. Monthly event nights are run at the venue for about £40 which includes a three course dinner and entertainment. Coming up in July is a Calypso night with singers and dancers, and then in August there’s a Ratpack night. I like venues that are run by a small and dedicated team because their passion translates in to the food and the service. That’s exactly what The Bluebell will offer you. Quality produce, well prepared, and served with care and enthusiasm for what they offer. The £10 lunch offer really is extra-ordinary for this quality, so get there when you can. We will inevitably be back, which given that we get a nosebleed when we cross Brum’s middle ring-road, is testament to how much we liked it. Simply delightful. This entry was posted in Area: Out of Birmingham, Cuisine: English, Cuisine: Fine Dining, Cuisine: Modern Mixed, Price: Average, Price: Cheap as Chips - Inexpensive, Price: Get your dad to pay - above average, Venue type: Bar, Venue type: Pub, Venue type: Restaurant, Venue type: Wine Bar and tagged Birmingham Restaurant, birmingham restaurant review, birmingham review, eating out in birmingham, Out In Birmingham, out in brum, OutInBrum, restaurant review, where to eat in birmingham, Where To Go In Birmingham, where to go out in birmingham. Bookmark the permalink. Looks like a lovely place! 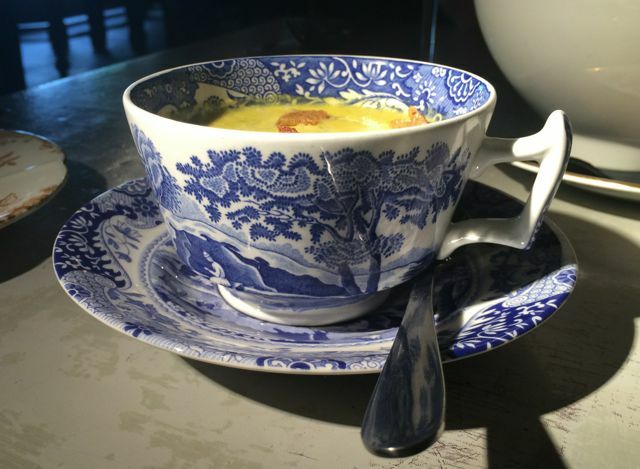 The dessert looks delicious and love the idea of soup in a teacup!